What makes practicing predictability so important? While this is an extremely dense concept with a multitude of science and data behind it, we will look to address key attributes to the concept of predictability as it pertains to our ability to repeat productive practice principles. From an offensive perspective, the game of baseball is predicated entirely on the art of deception. As a hitter, we have to sort through a variety of different variables in an effort to make the best decision possible. When we discuss the concept of predictability, we are referring to practice that allows our mind an ability to plan the body's movement based on past experience or patterns. To quote the book, The Performance Cortex by Zach Schonbrun, "the brains involvement builds on past scenarios". When you think about the routines established in traditional baseball practice, the volume of repetitions are geared towards preparing us for 4-at bats each game. If we take 100 repetitions to "prepare" our mind and body, we have to be able to draw on those repetitions for potentially 4-swings in high leverage situations. When we think about the ability to develop better off-speed recognition or the ability to hit a plus fastball, it is imperative that our developmental process reflect this level of "predictability". In fact, it takes less than 2/10ths of a second for the brain to send a neurological signal to the body in the form of reaction. Our minds ability to connect with our body in these types of environments requires an ability to sort through possible outcomes in a rapid manner. To better understand this system of chaos, we need to first appreciate the process of reaction in the skill acquisition process and how that guides our ability to move efficiently. "The Performance Cortex", to view a sample of the material, CLICK HERE. It is widely known that at the highest levels of our sport, the baseball traveling to home plate allows for 4/10th's of a seconds time to create pitch recognition. 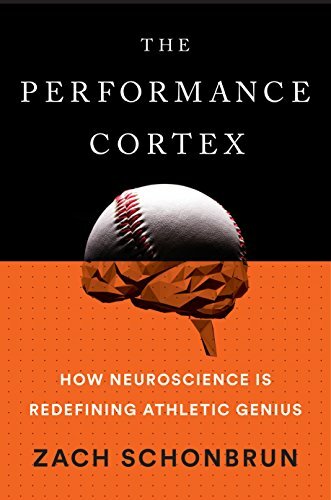 When we think about the degree for error, it's astounding that the human body is capable of creating any sort of recognition let alone a connection to the baseball given the variables associated with pitch type. The primary difference between a reaction and a reflex is that a reaction is voluntary, meaning that it requires some level of thought or interpretation of the data presented. Every detail from the angle of release to the fingers position on the ball to the axis of rotation is providing information in an extremely quick window of time. These features in addition to the other variables such as stress and fatigue on the athlete make for an extremely complex system. The brains ability to receive information and send a response signal back to the specific muscle groups takes time in itself. If we are only relying on the information that the ball is giving us in that moment, we will not have enough time to make a productive decision. The brains involvement in the process builds on scenarios which we must reinforce through our practice routines. Citing another example from The Performance Cortex, "the intent to move drastically alters the neuron firing pattern." Going back to a previous statement that I had made in the article above, if we are simply relying on the information we gather from the point of ball release to the point of contact, we will have almost no chance at hitting the baseball consistently. There is slack in the system between recognition and reaction that is only made up given the brains ability to predict based on past situations. The intent to move is in reference to the ability to plan and shape the movements we wish to execute which can be broken into three sections (per Schonbrun) : Planning, Execution and Feedback. Planning: Deciding what to do and how to do it. Feedback: Updating the plan for future use. In a simplistic overview, the concept is derived from the athletes ability to plan and then execute the desired skill with an understanding that the feedback loop is what generates future predictability. To quote Fergus Connolly in his book, Game Changer, "the game is constantly subject to dynamic feedback". In my view, this is the most critical element to productive practice: The need to establish environments for our athletes to train in that create realistic models for predictability. Why? Well, this game is comprised of an infinite different results. While we see patterns in terms of the results (92 MPH Fastball, Low and Away) there are an extraordinary amount of potential factors that make each pitch so unique. Our job as a hitter is not to be able to account for each individual change but to become better at recognizing the patterns that certain pitches (and pitchers for that matter) fall into and adjust accordingly. When we think about the Intent to move, we can look at this from a mechanical perspective. Elite hitters have an ability to begin their swing while delaying the actual commitment to the baseball longer than others. They have a loading pattern that allows for them to begin creating force into the ground and removing slack from their swing system in an effort to "see the ball". This type of entry into the swing allows for a hitter to maintain momentum and "re-direct" the barrel of the bat to the ball rather than starting from a break or a subtle pause. These series of pauses bleed out energy from the system and require the body to quickly adapt, typically with a loss of power, direction and efficiency. The goal of our loading process needs to be in an effort to see the baseball with the intent to swing. That doesn't mean that we are going to commit to that specific pitch, it means that the loading patterns up to commitment must be in preparation to swing. As an athlete, we are consistently searching for ways to improve and from an improvement perspective, we are completely dependent on the amount of time that we have to develop our skill. We all have 24-hours per day, 168-hours per week. How we maximize our time and attention to detail is critical for making long term gains. From a patterning perspective, we need to allow our bodies to move as efficiently as possible so that when we layer stress onto the skill we have a foundation and "feel" to work through. As it pertains to performance and the concept of patterning predictability, we can't ignore the task of "seeing the ball" and pitch recognition as a viable tool. Those "baseball instincts" are the result of deep practice and observation to the game that are paramount to success.